Carpal Tunnel Syndrome occurs when there is pressure on a major nerve in the wrist called the Median Nerve. This is the nerve that allows the hand and fingers to move and receive sensations. With Carpal Tunnel Syndrome, the hand and fingers can feel numb, weak, or experience a tingling sensation. The syndrome is named after the portion of your wrist where the nerve enters the hand, called the Carpal Tunnel. It’s very narrow, which means any swelling can cause the nerve to be pinched causing pain. People who perform repetitive tasks which cause stress to their hands and wrists are most likely to be effected. It can be caused by prolonged sewing, typing, writing, driving, assembly line work, hand sports, and even playing instruments. Some illnesses, such as diabetes, hypothyroidism, rheumatoid arthritis, kidney failure, and even menopause can increase the risk of Carpal Tunnel Syndrome. If you believe you are suffering from Carpal Tunnel Syndrome in Broward County it is important to seek out doctors who are experienced with the syndrome. Dr. Charles Kahn, Dr. Wayne Riskin and Dr. Yesenia Santiago-Casas are the first and leading rheumatologists in the treatment of Carpal Tunnel Syndrome in Hollywood and Pembroke Pines. They will first look for symptoms like numbness or tingling in your thumb, palm, index finger, or middle finger. They will test your grip strength and may tap on your median nerve to determine your pain level and how far that pain travels. They may also conduct tests like Electromyography, Nerve Conduction Velocity, or wrist x-rays. 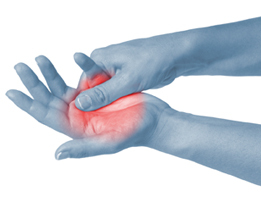 Once they have diagnosed you with Carpal Tunnel Syndrome they will discuss a plan for treatment. This may entail wearing a splint, using hot and cold compresses, and changing the way you work. You can attach devices to keyboards for example, that will reduce the amount of stress your wrists endure at work. They will also ask you to avoid sleeping on your wrists. Medication can be prescribed in order to reduce inflammation. These could include ibuprofen, naproxen, or even corticosteroid injections. For South Florida Carpal Tunnel Syndrome patients with severe cases, a surgery called carpal tunnel release can often relieve nerve compression. Dr. Charles Kahn, Dr. Wayne Riskin and Dr. Yesenia Santiago-Casas work with all their patients to find the treatment that works for you.